Though tired from our morning trek down to the village of Batad, we had to move our asses back on the road. It’s been raining every afternoon according to Bernie, and we better get ourselves moving before the rain pours. I honestly wasn’t too keen on visiting Tappiya Falls. Maybe I’ve seen too much waterfalls in the country to be excited by another one, but since we’re already here, I see no point of passing up the chance, and so, the arduous trek began. The path was easy at first – we had to make our way past the houses of the locals and stores that sell souvenir and snacks. Then we reached the famous rice paddies of the ampitheater terraces (I still can’t believe that I was walking on them!!!). It was actually on the steps of the rice terraces that you would see the beauty of Batad – wherever you looked is an overwhelming beauty as a result hard work of the Ifugao – rice terraces all around you, with an Ifugao village at the center of it all, seemingly taking the lead role in the most perfect stage. It was indeed breathtakingly beautiful. Bernie points to another rest stop up a hill. He says it was beyond that point that we were to see the falls. It was still a long way to go. We trod on – the vastness of the rice paddies took our minds away from our fatigue. While walking downhill, I met a couple who just came from the falls. “The more difficult part lays ahead,” the guy said. Uh-oh. My knees were already wobbling, and I wasn’t too sure how long I’d manage to keep up with the physical tasks of the trek. Thanks to the steep steps and my short legs, it was a real challenge. I had to make sure that I have both my feet on each step before I take another one forward. Slowly but surely, each of us made our way down until we could just hear the rush of water from the falls. We made it! We rested first at the small store which served as a viewing dock for the waterfalls. The falls were near yet we still had to go down a steep portion of the mountain. Finally, we were there, playing, lying and sitting on the rocks that stood still against the mad current caused by the waterfalls. The cold water where our feet were soaked was refreshing. We took our own sweet time and lingered at the falls. A crowd of tourists began arriving, which signaled our departure. It was time to face the great mountains again. The steep slopes became doubly burdensome, as I not only have to make huge steps, but I also had to manage my breathing. My heart was pumping too fast. It was good to have the stores that serve as our rest stops. 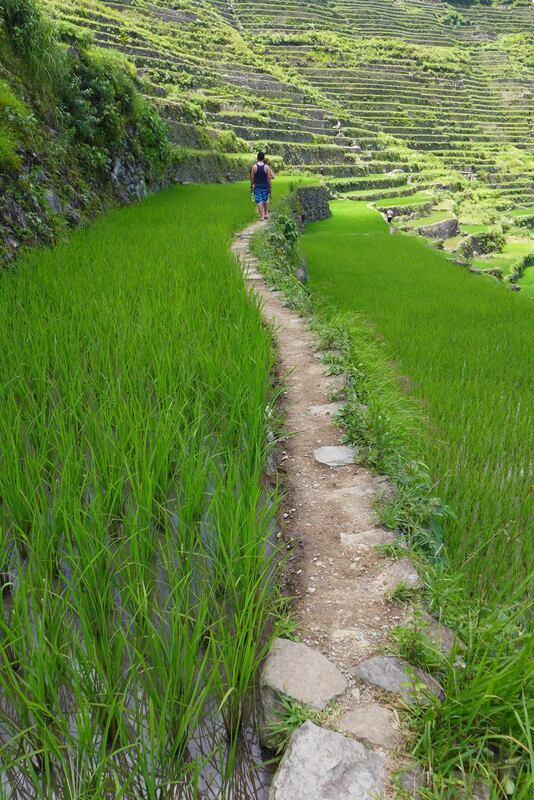 Once we were back at the rice terraces, the trek became easier. The grey clouds also motivated us to move faster – rain was near. We had to make it or else we’ll be soaked. Thankfully, we arrived at the guesthouse just in time before the rain poured. This entry was posted on May 22, 2014 by Karen in Philippines, Travel and tagged adventure, Batad, friends, Ifugao, Philippines, photos, rice terraces, travel, trekking.